Butter the pan well. We mean really well. Boil the almonds in water for just a couple of minutes. Then run the almonds through some cold water. This loosens the skin to the almonds allowing the skin to come right off when rubbing them with your hands. Peel the skin from about a dozen almonds and cut them in half the long way. Add in the sugar and beat a high speed until light and fluffy. Add the sour cream into the mix next and mix well for another minute. Gradually add the Semolina and mix until blended. Do not over beat. 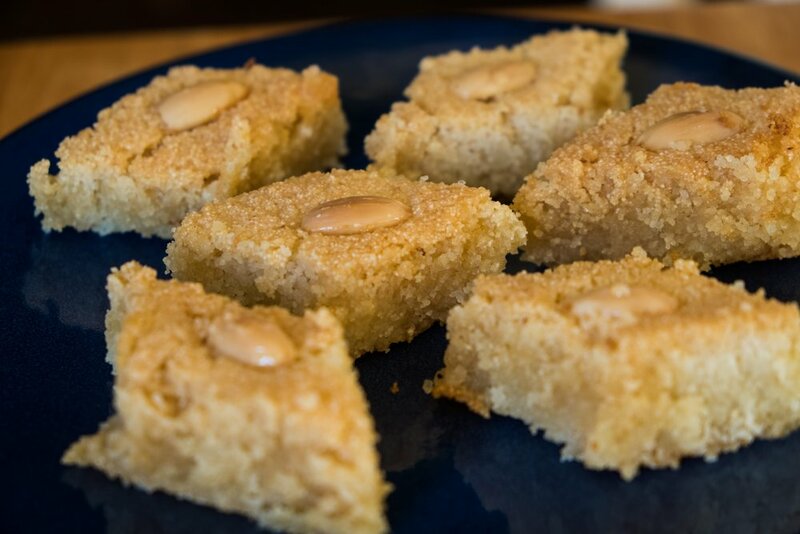 Lay the almond halves in a grid design across the batter (see image below for example). 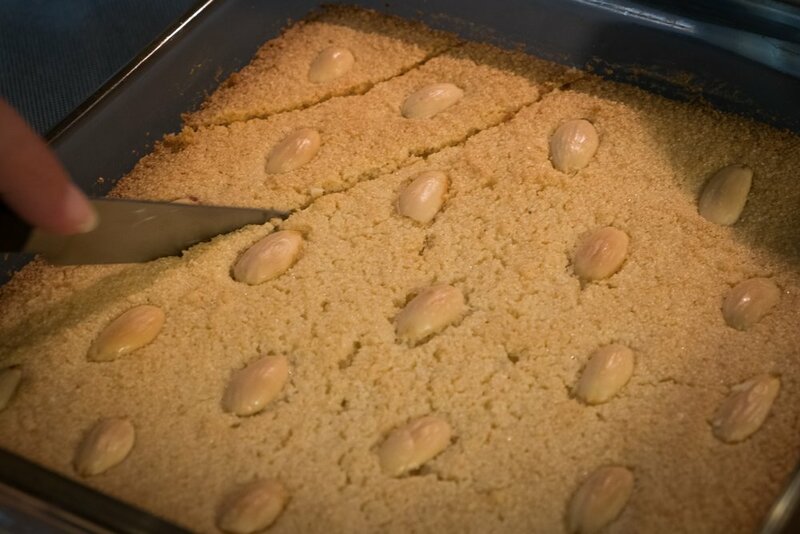 So that when Basbousa is cut (after cooking) 1 almond half lies in the center of each piece. While Basbousa is baking make the syrup. Useful Tip: An easy way to determine if the syrup is ready/at the right consistency is to place one drop of syrup on a plate and let the drop cool. Tilt the plate. If the drop runs down the plate then the syrup is not yet ready. 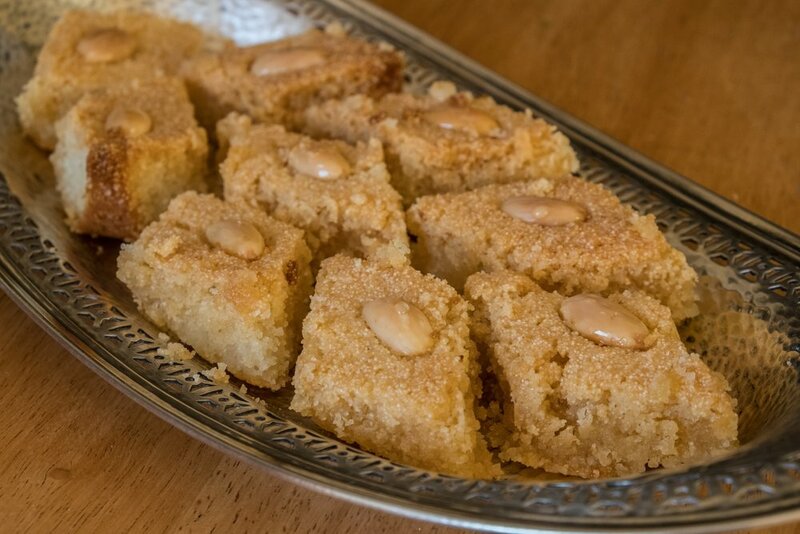 When the Basbousa is done, immediately remove from the oven and cut into diamond shaped pieces. Spoon the syrup evenly over the whole pan. Make sure that the Syrup falls into the edges and cut lines. This recipe comes courtesy of Esther El-Kodsi.